Huge thank you to This is Not a Drill Collective‘s curator Melissa Smith for the support throughout the project. Special thanks to Toki Babai for encouragement and feedback. Example of a #TiNaDCollective image (Instagram video still) and its sound clip waveform (2 sec). Concept. This instance of Telematic Café contemplates data. Is there meaning in data? What makes it? Data visualization is a booming obsession of post-industrial informational economy. Visualization delivers value – whether it’s an academic research or a business. To use folklore – data visualization “tells stories.” What exactly are these stories? What is there in data? Is this representation as “big”, or – “small”, as the reality? What happens, when something happens? The Song of Memories is about these questions, alluding to the ideal – visualized data externalize the reality of a process. Placed inside the event and inhabiting the eyes of participants and viewers the project imagines capability of poetic capturing, within a song, the very emergence of This is Not a Drill Collective, considering creative becomings, serendipitous connections, floating vibes, and interactions of artistic materialities, claiming to be “the song of memories.” An epistemological exercise of knowledge capture. What always escapes documentation of collective practices is precisely the target of this venture. 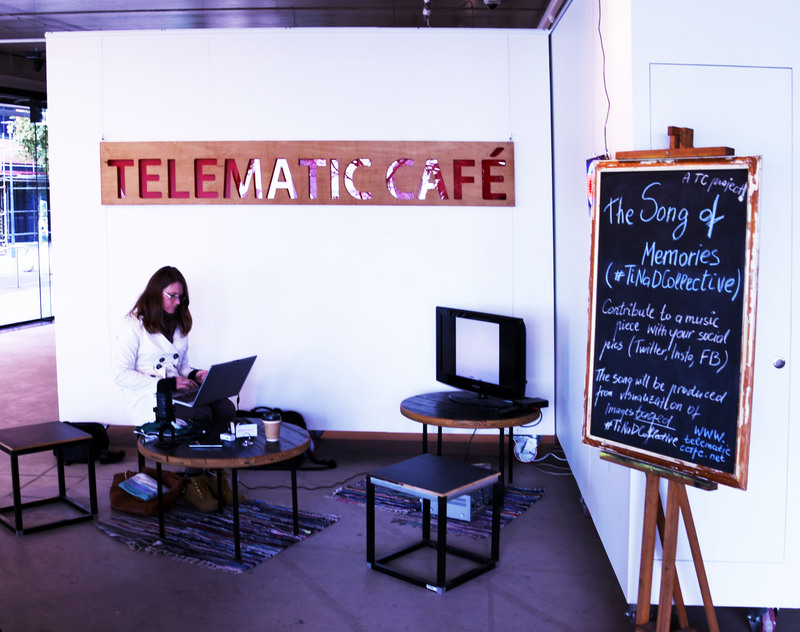 Telematic Cafe in operation in the Project Space – Deakin University Waterfront, Geelong. While the event resonates as a song in the sphere of truth, the visualization itself is a desire. The digital information produces – in this case – noise out of images and new visual data (waveform)- an abstraction and aesthetics. Meaning can be invoked by relations between visual and sound information. Waveform and sound has (new) perceptual value, and the act of translation from one media to the other aims to point out that there is something (the meaning) behind. The representation is that of the sublime, which does not account for the qualities of moments of social time. Or, it’s the Reality with the capital R rather than reality with the small r. In early days of computerized visualization in art (2002) new media theorist Lev Manovich pointed out: visualization is significant in itself, dealing with computation; it relates to thinking and perceiving abstraction by visual research, so it’s very nature is the tendency to be “anti-sublime” and data visualization art is able to affect through the beautiful . What if the horizon of visualization aesthetics is social space, the space of production? Flattening out the world is inevitable, or should it be so? Media and social theorist Ned Rossiter discerned “new media empirics” where belief in quantification of everything characterized a perceptual strategy anchored via the linear relation between data and reality (say, technical analysis of real-time histograms in stock trading). The power of affect constitutes the gap between reality and simulations (which can be seen in correlation with the abstract and the beautiful – or noise); visualizing data reduces the complex field of forces – a much larger web of relations that might be at play. To go beyond representation one needs to admit the process instead: Rossiter’s “processual media theory” radicalized empirics making sense of the environment, communication and feedback loops . This is Not a Drill Collective on Saturday 7th July 2018 featuring electronic musicians and audience in the gallery alongside projects from visual artists and performers, and Telematic Cafe. 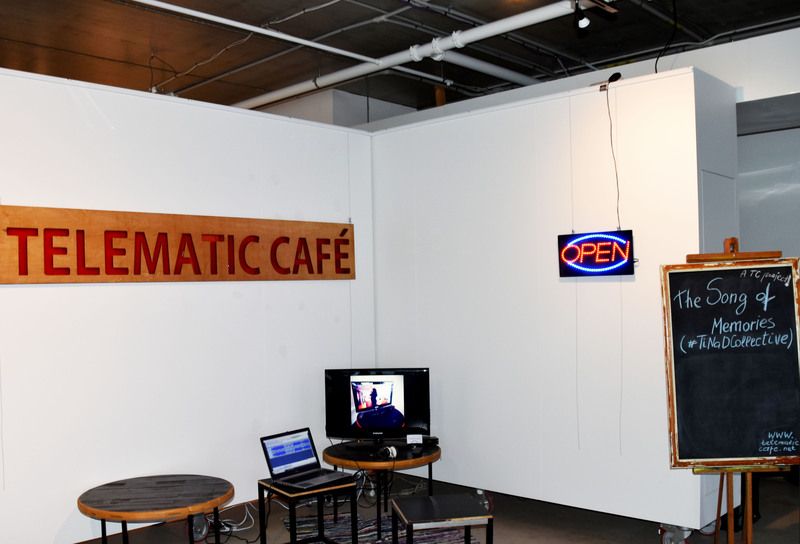 In the gallery, Telematic Café reorganizes perspectives: a historic Telematic Café time lapse plays in the first days; in the second week – the retrieved social media pictures of #TiNaDCollective are replayed back on the screen. The photos telematically resonate in social media and develop new encounters/ perspectives, these develop a spiraling course through interfaces – gallery, mobile, screen. If one is to handle data objects and archives, then second order cybernetics must be at work – the observing subject is part of the observed system, new contexts are added and fed back, as in Rossiter’s processual aesthetics. 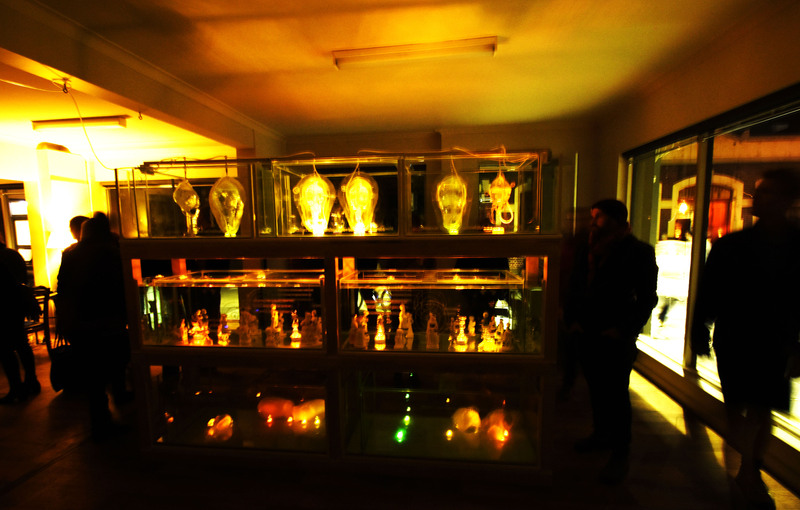 In accord with the event’s disclaimer “this is not a drill” the The Song of Memories evolves at Telematic Café running process and wanting to come to some relation between visualization and reality conditions. 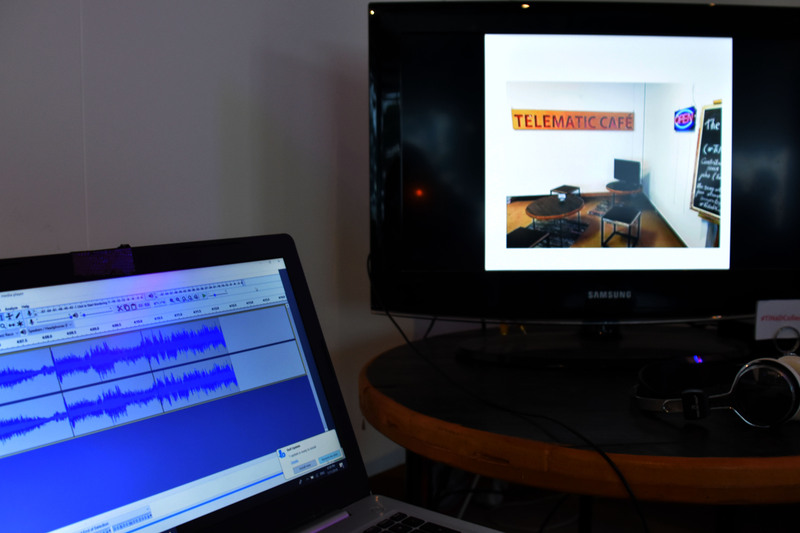 Gallery view of Telematic Cafe showing the sound file (on PC) produced from social media images (on screen). In ascertaining limits of “data visualization,” the mere result of The Song of Memories (#TiNaDCollective) certainly does not propose an expert solution or reasonable response to the challenge! It’s idea is social meaning linked to specific location and historic time of the event. Equate memories to imagination. The result is yet another thing, other things, anyway. Someone reads patterns of code – new knowledge emerges. Some find technological sound a depressing way of conceiving the world, even more so – a repulsive form of aesthetic recycling. For others – electronic rhythm and dynamics are pleasing to their senses. See Lev Manovich, Data Visualization as New Abstraction and Anti-Sublime, 2002. See Ned Rossiter, Organized Networks: Media Theory, Creative Labour, New Institutions, NAi Publishers, Institute of Network Cultures, 2006. Posted in Communication, Data, Data visualization, Events, New Events, post-fordism, Telematic Communication Models. Posted in Communication, Data, Events, Labour, Making, New Events, post-fordism, Technology, Telematic Communication Models. Posted in Events, New Events. 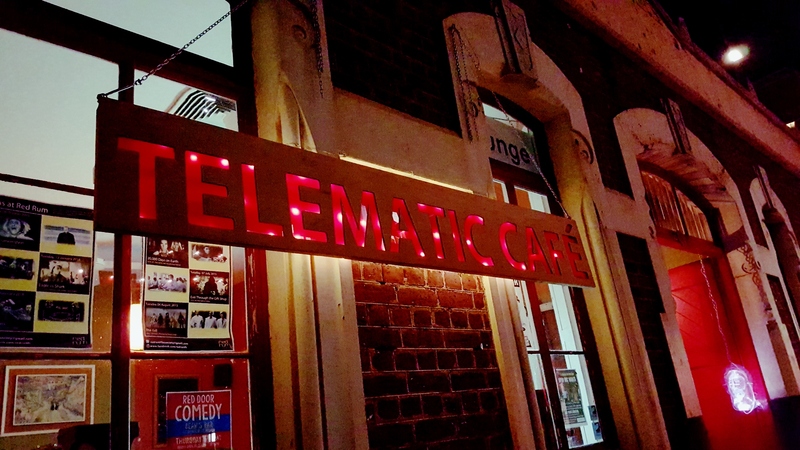 The next edition of Telematic Cafe is here – and will form a part of Geelong After Dark, 6pm to 10pm, Friday 6 May 2016. 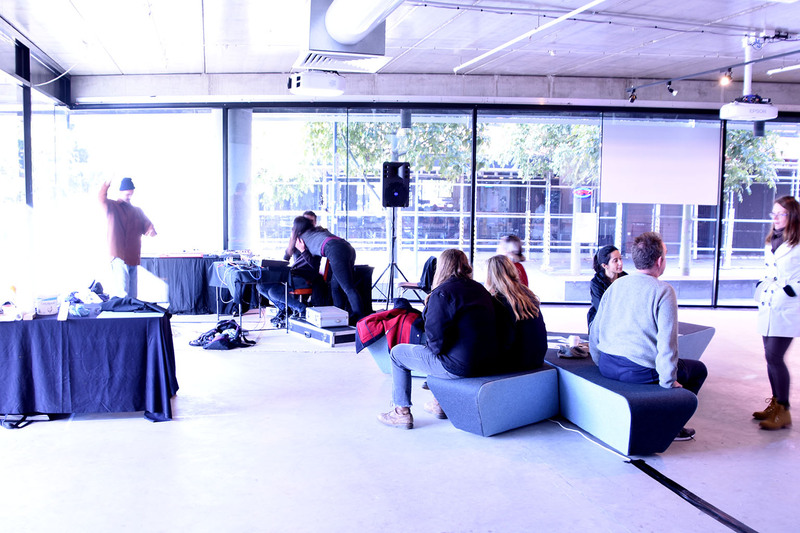 Addressing this year’s festival theme – “air” – Telematic Café draws on the nature of air as it signifies immateriality and space, and is titled Telematic Café: On Air. “Telematic communication models” are therefore relating to the capacity of constructing new spaces, highlighting the merge of separate worlds and modes of materiality and providing expanded/new areas for communication, experience and existence. 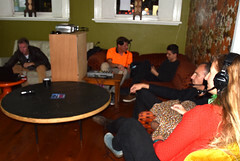 In the framework of Geelong’s own Night Arts festival – Telematic Cafe will open up for the night to temporarily occupy and transform two very different but close locations to create site(s) that will make the art experience a tangible /physical activity which – metaphorically – compares to the process of having a coffee within the social environment of cafe. 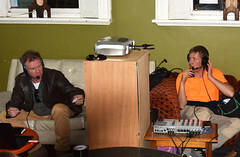 Telematic Cafe: On Air is composed to offer four projects across two locations. Kazuhiro Goshima (JP). SHADOWLAND. Through a poetic narrative this stereoscopic (3D) film explores the creation of 3D vision with DSLR camera. 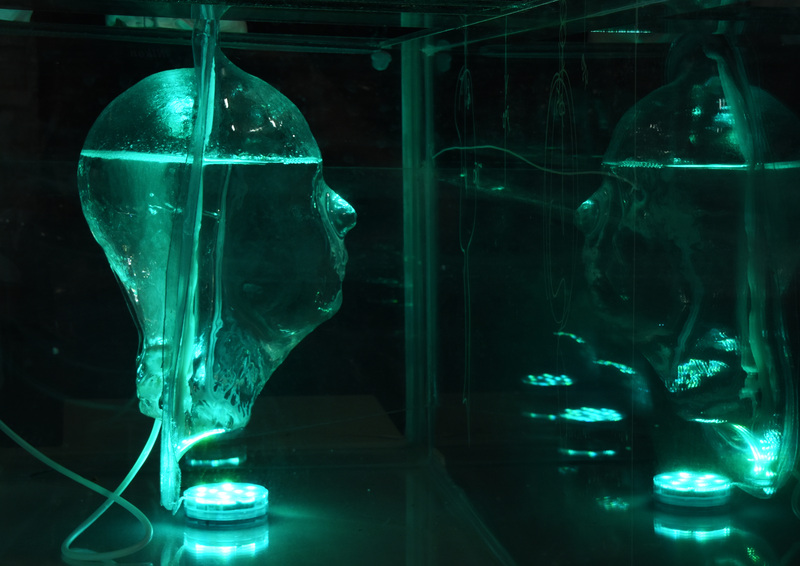 The work brought the artist the Award of Distinction at Ars Electronica 2014. 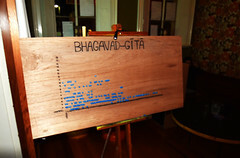 Radio Whispers (Bhagavad-Gita) with THE PULSE 94.7FM (community radio) and Geelong Amateur Radio Club. 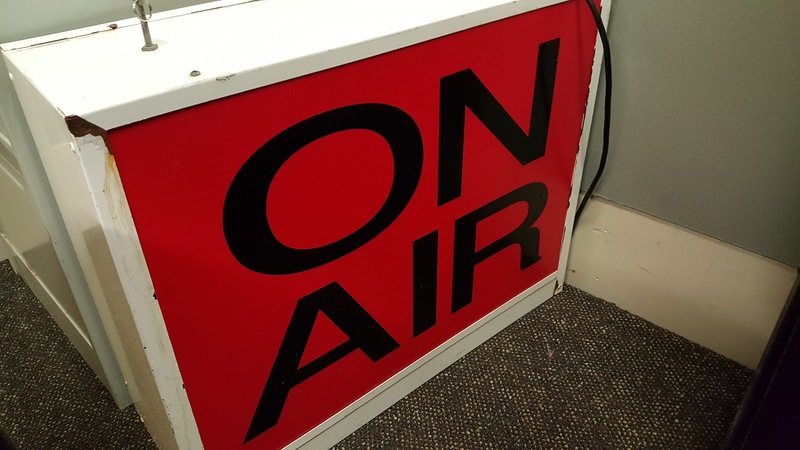 A collaboration on radio waves and a chance to explore the construction of radio as the apparatus of communication – from live production and broadcast to listening. Stephanie Andrews, John McCormick, Jordan Vincent and Deakin Motion.Lab. DUET. Exploring the newest technologies, this virtual reality experience brings you into communication relationships, via movement, with your artificially intelligent partner. Michael Morgan. SYMBIOTIC ILLUSION. A monumental installation reflecting the material qualities – solid, liquid, to air-like and a statement of the metaphor about illusionary nature of coexistence and the contradiction contained in human-related conflicts. 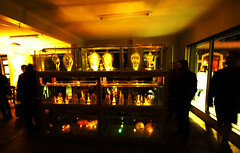 Telematic Cafe: On Air is curated by Marita Batna. Top Image: Michael Morgan. Symbiotic Illusion (detail), 2016. Posted in Communication, Events, New Events, Telematic Communication Models.